If you’ve been in an Express store recently, you may have noticed that we’ve got a thing for gingham. Like leopard and nautical stripes, the pattern is so classic and preppy-cool, it almost feels like a neutral. That’s why we used the cheeky check on skirts, dresses, tops, and even shoes this season. Try it with bright color accents for high-contrast look that works for practically any occasion. Here, five gorgeous examples to get the outfit ideas pumping. Spring can’t come soon enough. Nothing against a great pair of heels, but when it comes to dinner attire, it’s all about waist-up statements. An off-the-shoulder gingham top and pair of bold statement earrings are a one-two punch that’ll have your date leaning in all night long. When the weather gets warm and it’s officially cute dress season, nothing beats a gingham sun-dress and a bright-color sandal. Super hydrated skin, a fresh-from-the-salon pedicure, and your best natural hair will make this outfit sing. Revive your 9-to-5 style with a gingham pencil skirt and pastel purple sandals with a substantial, work-friendly heel. The combination goes with all of your favorite office shirts, from the black turtleneck to white button-down and beyond. 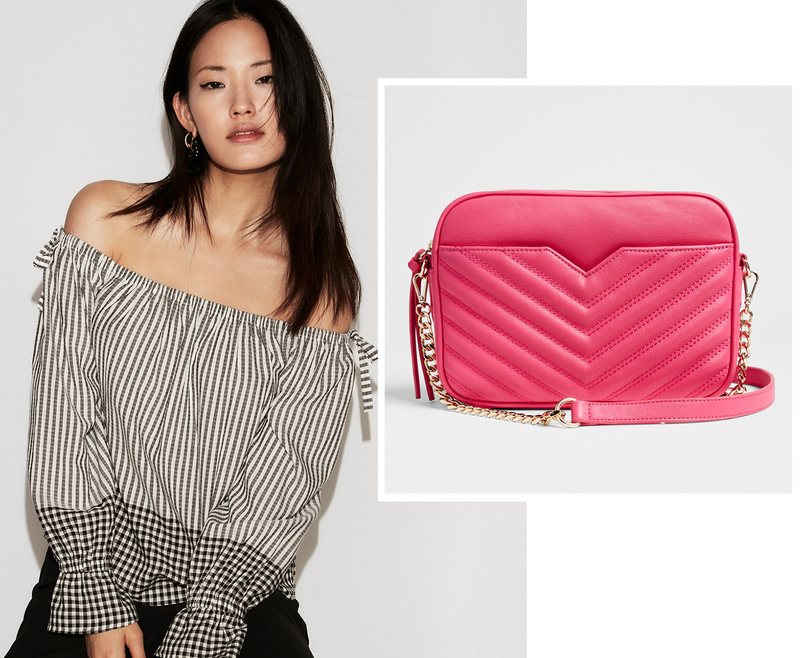 There’s something so fun about gingham, stripes, and a hot-pink shoulder bag. Whether you style this combo to look preppy or straight up chic, this ensemble will keep your spirits high and your selfie game on point all night long. When spring activities take a turn for the romantic (think: vineyard tours, oceanside lunches, and garden cocktails), a bold-color jumpsuit that pops against blue skies and beautiful views is a stylish—and comfortable—choice. Finishing the look with gingham slide sandal adds to the effortless femininity and ensures you’re ready for the next activity.